Today Steam Forge has announced the newest member of the Blacksmiths Guild, Cinder the new Apprentice on the team. With a very reasonable stats across the board including a very nice 3+ defence and 1 point of armour Cinder looks set to be a very nice addition to the Blacksmiths team, she is able to get around the pitch in good time and should be able to hold her own for the most part. 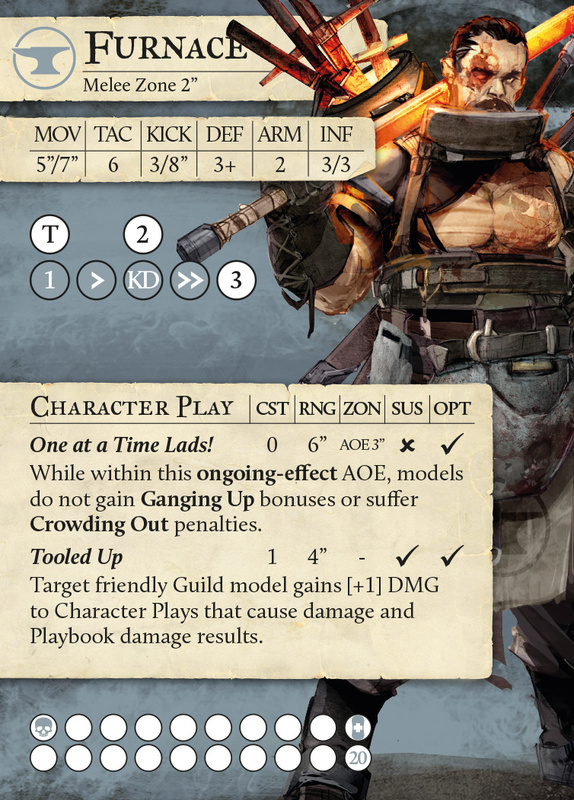 With a Tac of 5 (the amount of attack dice rolled) which could be boosted to 8 on a charge you can potentially be looking 4 damage generating 2 momentum or even 6 damage with one momentum, admittedly you are going to have to be rolling hot dice to pull those results off, but with a playbook of 5 results getting a wrap around shouldn’t be too hard to manipulate. So how can you manipulate your attack results, well if you attack with Furnace first, you are already hopefully going to get a crowded out bonus, possibly even attacking a knocked down model if you have been witty with Furnaces Playbook uses which include Tooled Up which would make the 4/6 results mentioned earlier become 6/7, also whilst attacking in conjunction with furnace the first attack causes to the first attack that causes Damage. Considering your target has hopefully been softened up a bit by Furnace this should lead to a very easy take out, especially if you have maxed out Furnaces and Cinders Influence. 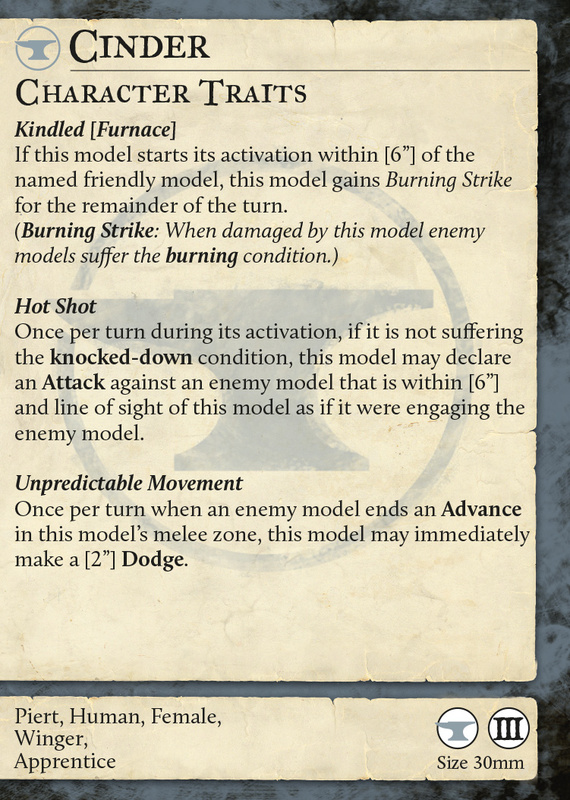 Furnace ‘Tools Up’ Cinder and then charges target model attacking with 9 dice (not including any other modifiers) even with poor rolling you should be able to get a Momentous Knock-Down, on either the player Cinder is about to charge or any supporting players that could get in the way. Cinder activates and depending on the damage left on the target could either use decoy to help keep her going till her next activation or to avoid counter attack or straight up charge in and going for the kill 5 attack dice with an extra 4 for charging plus another one for Ganging Up (hopefully) gets a ten dice attack pool, now a really good roll could see 10 successes causing 10 damage (2 lots of 4 damage with +1 for tooled up on each damage) which will also cause the burning condition (-2/-2 movement and 1 Damage in maintenance phase), whats more likely though is probably five or on a good day 7 damage and 1 momentum, but Cinder is still going to have 2 actions left so you could even go for 6 Damage 2 Momentum on the charge attack and on further attacks which will have the same bonuses except the +4 dice charge go for the 2 momentous damage (becomes 3 with tooled up) so a good attack run could see 12 Damage and 4 momentum, one of which you could use to attack again for a total of 15 Damage and 4 momentum, which would see most opponents out for the count and a 2 VP boost to the score board and an extra point of momentum, which would equal a possible 5 momentum from one activation. 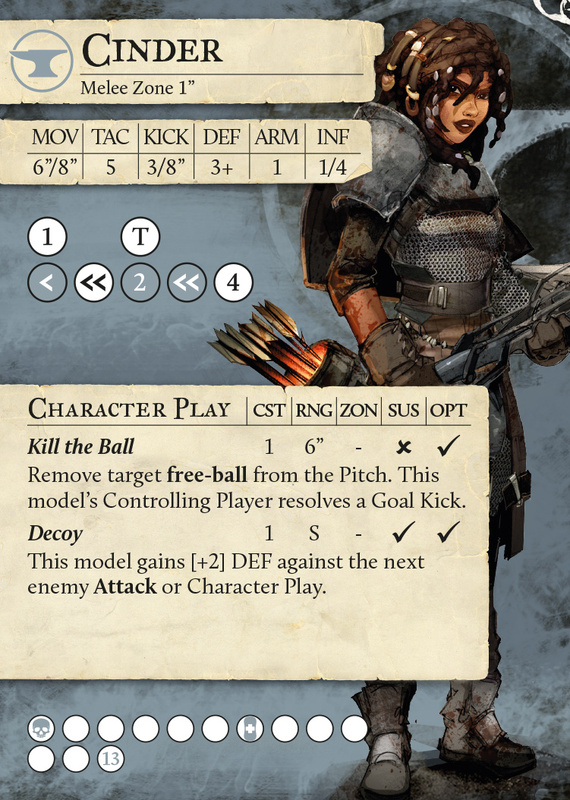 I suppose as Guild Ball is a football game I should note that the kicking stats are about average for a winger, an 8″ goal threat coupled with an 8 inch jog is going to make cinder a threat from quite a distance, especially with her kill the ball ability, which causes a free ball to be removed from play and the player to make an immediate goal kick, potentially getting it within range of Cinder to snap to and make an attack on goal. If you want to keep posted of all our latest content you can find us here on Facebook and if you would like to support us and our content you can find our Patreon page here.